Somewhere deep inside, we all know what matters most to us. But as busy as we all are, we rarely take the time to explore the guiding principles and deeply held beliefs that underlay everything we do, let alone to scrapbook about them. 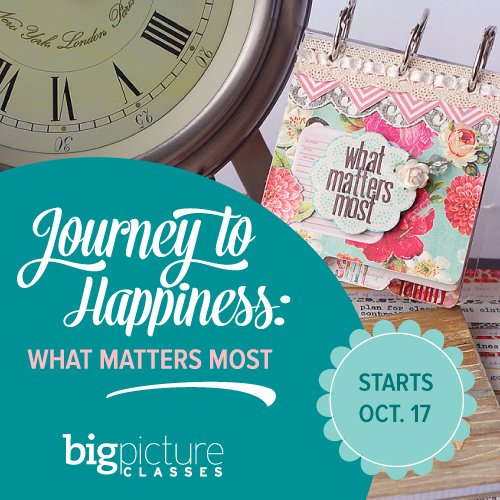 Now, in this returning 4-week workshop, Journey to Happiness – Discovering and scrapbooking what matters most to you, from veteran instructor Lisa Day, you’ll have the guidance you need to define what matters most to you. Armed with this knowledge, you’ll set up creative action plans to help you stay true to your most important priorities—and you’ll make pretty projects to reflect them! Lisa will walk you through four exercises in the areas of Awareness, Focus, Change, and Action. She’ll share valuable resources that will motivate you to make sustainable changes in your life. And she’ll guide you through four inspiring projects that will document your journey to happiness and harmony. The journey to happiness is an ongoing process, but with a clear focus and lots of creative encouragement, you can enjoy that journey every step of the way.